Support OFMA by donating clothes and household items at this fall's annual "Fill the Truck" event. Bag or Box your unwanted cloth items and bring them to the OFMS parking lot on Saturday, August 4th (8:30AM-2:30PM). Find out more by clicking here . 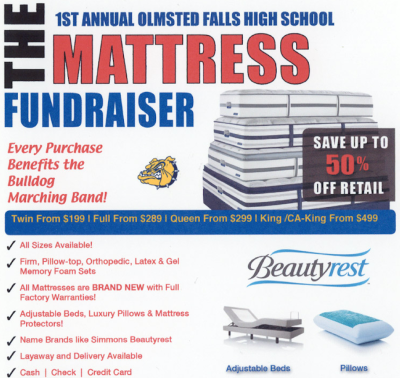 Come get a better night’s sleep AND support the Bulldogs Marching Band at The OFHS Band's 1st annual Mattress Fundraiser! We carry quality name brands like Simmons Beautyrest, Southerland and Symbol mattresses priced up to 50% OFF retail prices. This sale is ONE DAY ONLY (Saturday, August 4, 2018, 10AM-5PM) in the OFMS Cafeteria, so invite your family and friends. Profits go directly to the Bulldog Marching Band. Download the proper referral form at the link below and bring it with you to the event to ensure a maximum discount. Print out the form (located here) and take it to Burntwood Tavern at 19304 Detroit Rd. in Rocky River for lunch or dinner June 11th through December 15th. Fifteen percent of your bill will be donated to your favorite OFHS Marching Band student in support of his/her trip to Orlando, Florida in the coming school year. The OFHS band program currently have approximately 350 students and is estimated to continue to grow in years to come. The large number of students has brought some challenges when it comes to playable instruments. Despite a very active music association and supportive administration that provides financial assistance, it is hard to keep up with the financial needs. Some instruments are falling apart and are being held together with duct tape. 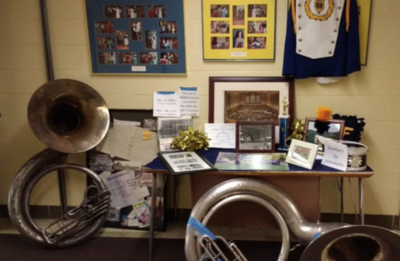 Many of the instruments are over 30 years old. Some students have had to switch to a different instrument, because of the lack of working instruments. Please consider supporting OFMA's “ Rally for Music ” campaign and donate to the Instrument Repair and Replacement fund. Support OFMA and purchase Krispy Kreme donuts at OFHS varsity football games, OFCS band and choir concerts, and other activities.